Revelation has had a very large role to play in human history. The evidence not only comes from religion but also science. This article was originally published in June, 2007 volume of Ahmadiyya Gazette USA. Let me first introduce the subject of revelation in language and examples that are more familiar to my Western readers. As Joan suggests, there is nothing extraordinary about hearing the voice of God, but one needs to make the effort to listen. Whether we call what we hear the voice of god or of conscience, the sound of silence or the rhythms of the breath, the lives of our four sages remind us of the necessity to stop and pay attention to our lives. Taking time to be quiet and attending to our lives need not result in some intense, enlightening religious experience. Indeed, such intense moments are rare. But it must be a regular practice, just as Muhammad stopped to pray five times a day and the Buddha meditated in the quiet of each night. It is simply a way to remind ourselves of what is really important, because we forget. In accordance with the purpose of human life, Allah has gifted human mind with dual capabilities, intellectual and spiritual! What does science say about how the human mind works? What is the known physiologic basis of dreaming or revelation? To study all these questions one needs to study the unconscious or the subconscious mind. Human mind can be considered to have two aspects, a smaller well known ‘conscious’ part and much larger but elusive ‘subconscious’ module. Subconscious mind is the set of complex mental activities within an individual that proceed without his full awareness. It is understood by the psychologists that such unconscious processes may affect a person’s behavior even though he cannot report on them directly. Freud and his followers felt that dreams and slips of the tongue were really concealed examples of unconscious content too threatening to be confronted directly by the conscious mind. All competent investigators now assume that the conscious part of the mind is a very limited and restricted area of the total per­sonality. This conscious part of the mind extends in varying degrees out into a much larger area of reality. The use of these terms conscious and subconscious mind in no way indicates that we possess two minds. The varied activities of mind should be considered as a part of a wide spectrum with varying level of awareness of its activities. A good analogy should paint a picture that indicates the essential unitary character of mind. Mind func­tions on two levels, or in two areas, namely, the conscious, self­ aware part of mind and the creative and ingenious subconscious level. This two­fold nature of mind activity does not indicate two minds or one mind with two separate divisions. Mind is a unity and functions as such. The two-fold activity of mind is an interrelated process. The conscious mind can be considered to be the tip of the iceberg with a much larger capacity in the form of subconscious lying hidden from our eyes. Psychologists have used various illustrative analogies to describe the relationship and function of two levels of mind. Sometimes metaphor of an iceberg is used for conscious and unconscious mind. 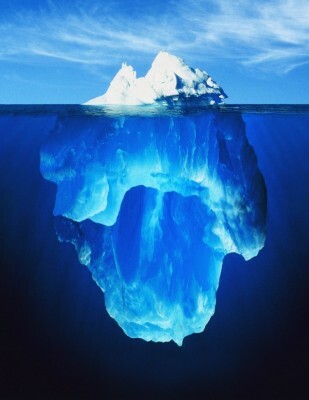 The conscious mind is above water and the larger subconscious mind is like the submerged part of iceberg. Another approach to this problem is to compare the conscious and subconscious mind to coral islands found in some parts of the ocean. On the surface of these coral islands there is a small circular ridge of a rock­like substance surrounded by ocean water. On this protruding edge is found a fringe of tropic vegetation. This is all there is to be seen on the surface, with no suggestion of the mighty structure down to the ocean’s floor built by uncountable millions of coral creatures during eons of time. The human mind is to a degree like these coral islands. Yet another analogy can be that of a well. This will be an old fashioned well six to eight feet in diameter, walled up with stones and filled with water. The well is the human mind. Sometimes we think of it in terms of the diameter enclosed within the brick walls. However, on deeper reflection, it is an ocean of water, extending its subterranean depth, into the subsurface water extending miles in every direction away from the brick wall. The only point at which the infinite reservoir of mind activity can be observed is at the very surface of the water in the well. The subconscious level of mind constitutes a volume of ex­perience and reality much greater in extent and in creative power than the conscious part of the mind, but it is obscure and is hidden from superficial examination. This sub­conscious mind carries with it all the mental images and emotional states which have been experienced during the life of the indi­vidual. In the analogy of well it extends under the surface for miles and miles as ground water. So much about the subconscious mind but we need to know a little about the physiology and basis of sleep to study this subject further. Sleep and dreams have aroused the interest of mankind since time immemorial, as reflected in the writings of the different religions and civilizations. These phenomena by their very nature have a mystique about them. Even though there are several poetic, philosophical and religious references to these phenomena, the science of sleep has began to develop in the last 50 years only and has picked up pace since. This revolution may be traced back to the discovery of a type of sleep characterized by rapid eye movement (REM sleep), first reported by the physiologists Eugene Aserinsky and Nathaniel Kleitman in 1953. This brought the awareness that sleep was not, as popularly believed, a state of unconsciousness. REM sleep proved to have characteristics quite at variance with the prevailing model of sleep as recuperative deactivation of the central nervous system. It was shown that various central and autonomic nervous system measurements, during REM stage of sleep, seemed more akin to wakefulness than the other type of sleep, called Non-REM sleep. It has been observed with the help of special scans by scientists that different parts of brain are as active in REM sleep as during the state of wakefulness. REM sleep is popularly associated with dreaming, especially bizarre, visual, and seemingly random dreams. So in the last few decades it has become common knowledge that sleep is not a passive phenomenon when different body actions are shut off. It is a different type of existence with all together different activities, far removed from a state of sheer unconsciousness. Given sleep’s heterogeneous nature, no single theory predominates, as it is difficult to describe one single “function” of sleep. Restorative theories of sleep describe sleep as a dynamic time of healing and growth for organisms. For example, during stages 3 and 4 of Non-REM sleep, or slow-wave sleep, growth hormone levels increase, and changes in immune function occur. In some studies sleep deprivation has led to decrements in immune function. Sleep helps in the neurological growth also. The newborn infant or neonates may spend an average of about 16 hours of each 24-hour period in sleep, although there is wide variability among individual babies. In neonates as the brain is actively developing majority of sleep is REM sleep rather than Non-REM sleep. In neonates 75% of sleep is REM whereas converse is true for the adults. It has been suggested, for instance, that the high frequency and priority in the night of REM sleep in the newborn infant may reflect a need for stimulation from within to permit orderly maturation of the central nervous system (CNS). Another interpretation of age-related changes in REM sleep stresses its possible role in processing new information, the rate of acquisition for which is assumed to be relatively high in childhood but reduced in old age. So sleep in general and REM sleep in particular has all the ingredients necessary for the reprocessing of all the learning during the daytime. The conscious mind goes to sleep but the subconscious mind is fully awake and well and kicking at full throttle. It continues to be seat of creative ideas and possible dreams, both bizarre and fantastic on the one hand and true dreams on the other hand. Promised Messiahas notes that the blessings of Al Rahman God are general and for all. He writes in Hakika Tul Wahee about the nature of true dreams or revelations, “God All Mighty has with a few exceptions granted all men with eyes, nose and ears and blessed them with sense of smell and other senses and has not been miserly towards any nation. Likewise, Allah has not excluded any people or nation from the blessings of the basic seed of the spiritual faculties. Just like you see that the sunlight reaches every place and no place whether clean or dirty is exempted from it. Same is the law for the light of the spiritual sun and it shines in all places regardless of the spiritual station. However, it is true that this spiritual light loves a heart that is clean, pure and true.” In other words, dreams, even the true ones, are a shared feature among all humans. There are, however, some differences in the true dreams of the ordinary and the pious. That will be examined later. Thomas Edison the famous American inventor, who, singly or jointly, held a world record of 1,093 patents, did most of his creative work at night subconsciously. The great French writer, Voltaire, known for his courageous crusader against tyranny, bigotry, and cruelty, frequently spent as much as fifteen to sixteen hours in bed, calling his secretary when there was anything to be committed to writing. Henry Cobb, the millionaire fruit packer, once said that all the really important ideas which helped him to build his business arrived in his mind at night while lying in bed. Elbert Hubbard, a freelance newspaperman, known for his moralistic essays, declared that his most important ideas came to him while working in his garden or riding horseback. There are numerous examples of creative work accomplished by men who moved through their activities with leisure and balance. Alfred Russell Wallace became a public figure in England during the second half of the 19th century, known for his courageous views on scientific, social, and spiritualist subjects. His formulation of the theory of evolution by natural selection, which predated Charles Darwin’s published contributions, is his most outstanding legacy. He would go for days and weeks feeling no desire or interest in work. During these periods he occupied himself with his garden or simply by reading a novel. Then, a sudden impulse would come bringing him an explanation, a theory, a discovery, the plan of a book, and this impulse usually came to him like a flash of light. Subconscious activity generally brought with it not only plans but the material, the arguments and the needed illustrations. From the years of my youth the unearned assistance of sud­den and unpredicted insight has been common. So says Walter Bradford Cannon, Professor Emeritus of Physiology at Harvard. While a stu­dent in high school I was occasionally puzzled by “originals” in algebra, the solution of which was not at all clear when I went to sleep at night. As I awoke in the morning the proper procedures were immediately evident and the answers were quickly obtained. On an occasion I was handed a complicated toy which was out of order and would not operate. I examined the mechanism carefully but did not see how the defect might be corrected. I resorted to sleep for a solution of the problem. At daybreak the corrective manipulation appeared thoroughly understandable, and I promptly set the contraption going. As a matter of routine I have long trusted unconscious proc­esses to serve me-for example, when I have had to prepare a public address. I would gather points for the address and write them down in a rough outline. Within the next few nights I would have sudden spells of awakening, with an onrush of il­lustrative instances, pertinent phrases, and fresh ideas related to those already listed. Paper and pencil at hand permitted the capture of these fleeting thoughts before they faded into ob­livion. The process has been so common and so reliable for me that I have supposed that it was at the service of everyone. An illuminating inquiry into the nature of the flash of ideas and the extent of its occurrence among scientific men was re­ported by Platt and Baker in 1931. In their inquiry into the appearance of hunches among chemists they received answers from 232 correspondents. Assistance from a scientific revelation or a hunch in the solution of an important problem was reported by 33 per cent; 50 per cent re­ported that they had such assistance occasionally; and only 17 per cent, never. Professor W. D. Bancroft, the Cornell Univer­sity chemist, tells of talking to four fellow chemists regarding aid from hunches and finding that to three of them the experi­ence was commonplace. The fourth did not understand what was meant by the reference and testified that he had never had the feeling of an inspiration, had never had an idea come to him unexpectedly from some strange “outside” realm. He had worked consciously for all his results and what was described by the others meant nothing to him. In typical cases a hunch appears after long study and springs into consciousness at a time when the investigator is not work­ing on his problem. It arises from a wide knowledge of facts, but it is essentially a leap of the imagination, for it reaches forth into the range of possibilities. It results from a spontane­ous process of creative thought. One night, after falling asleep over a trifling novel, Dr. Otto Loewi awoke possessed by a brilliant idea. He reached to the table beside his bed, picked up a piece of paper and a pencil, and jotted down a few notes. He was professor of pharmacology at the University of Graz and was working on demonstrating that chemical agents liberated at the end of nerves are the mediators of nerve activity to control the organs that they supply. On awakening next morning he was aware of having had an inspiration in the night and he turned to the paper for a reminder. To his utter despair he could not make anything of the scrawl he found on it. He went to his laboratory, hoping that sense would come to what he had written if he were surrounded by familiar apparatus. In spite of frequently withdrawing the paper from his pocket and studying it earnestly, he gained no insight. At the end of the day, still filled with the belief that he had had a very precious revelation the night before, he went to sleep. To his great joy he again awoke in the darkness with the same flash of insight which had inspired him the night before. This time he carefully recorded it before going to sleep again. The next day he went to his laboratory and in one of the neatest, simplest and most definite experiments in the history of biology brought proof of the chemical mediation of nerve impulses. He prepared two frog hearts which were kept beating by means of a salt solution. He stimulated the vagus nerve of one of the hearts, thus causing it to stop beating. He then removed the salt solution from this heart and applied it to the other one. To his great satisfaction the solution had the same effect on the second heart as vagus stimulation had had on the first one: the pulsating muscle was brought to a standstill. This was the beginning of a host of in­vestigations in many countries throughout the world on chem­ical intermediation, not only between nerves and the muscles and the glands they affect but also between nervous elements themselves. In the cases described above, it may well be argued that all the necessary pieces of information needed for the resolution of the problem were already in the conscious mind, the subconscious only proving to be a more powerful tool for synthesizing such information in some mysterious manner. It is possible to attribute Dr. Otto Loewi’s dreams to the subconscious mind for it can be argued that subconscious had all the ingredients that went into the dream. But what about dream or revelation content that is totally foreign to that person. Sometimes the revelation can be in a language foreign to the recipient. This novelty of content is true for many a dreams and revelations of the prophets of Allah. Many instances can be cited from the life of the Holy Prophet Muhammadsaw and Promised Messiahas. But, for the purposes of this article, let us examine two examples from the secular world in the experience of Friedrich August Kekule and Elias Howe. In 1865 a German chemist, Friedrich August Kekule, was struggling to solve a problem in chemistry that had baffled all researchers. One night Kekule had a dream in which he saw a snake with its tail held in its mouth. This dream instantly put him on the right track leading to the solution of the perplexing question. Thus was unraveled the secret of the molecular behavior in certain organic compounds, a discovery which created a revolution in the understanding of organic chemistry. He interpreted this dream to mean that in the benzene molecule, carbon atoms bond together to form a ring structure. This knowledge gave birth to the huge and highly developed field of synthetic organic chemistry producing a vast new range of synthetic materials. The contemporary pharmaceutical industry has become growingly dependent on synthetic drugs. Mankind is indeed indebted to that one dream through which Kekule resolved that problem. Elias Howe was the first person to mechanize the process of sewing. He too received the answer to a problem that had frustrated him for a long time through a dream. In his dream he saw himself surrounded by savages, who threatened to kill him unless he designed a sewing machine. Being unable to respond he was tied to a tree and the savages started to attack him with arrows and spears. It surprised him to see eyelets on their spearheads. On waking from this dream, he immediately realized the solution, which led him to invent the prototype of the sewing machine that was to dramatically revolutionize the sewing industry. Through his dream he understood that he should consider placing the eye of the needle in its point. It was this idea which helped him resolve a seemingly impossible task. It is difficult to visualize the sorry state in which man would find himself today without the blessing of this dream. What a revolution was created indeed by this revelation! How can we distinguish a dream arising purely from subconscious mind versus a revelation? It will have to be based on the judgment as to whether the subconscious could host the information revealed in the dream or not. If the information is altogether new and novel and there is no reason to believe that a certain person’s subconscious possessed that knowledge then the most reasonable explanation is to give credit to All Knowing Allah for that particular piece of information. In their uninhibited and unchecked secularism majority of psychologists and psychiatrists attribute all the dreams to unconscious mind. But there are certain things that the unconscious mind does not know so there is no mechanism for it to come up with secrets of the future or for that matter the secrets of past and present without being informed by the All Knowing Allah. We can reasonably conclude therefore, that God must have created such a highly advanced and intricate receptive system within the human mind for the ultimate purpose of communicating with Him. Divine revelation therefore has nothing of the bizarre and unnatural about it. There are three types of people who partake of true dreams. First there are those who possess no merit in themselves and have no relationship with God Almighty. On account of their intellectual appropriateness they experience true dreams and visions that are not characterized by any sign indicating their nearness to God and their being loved by Him, nor are they of any benefit for them. Thousands of wicked and vicious people share such experiences. It is often observed that despite such dreams and visions their conduct is not praiseworthy and their faith is very weak, so much so that they do not have the courage to bear true witness and they do not fear God as much as they fear the world and they cannot separate themselves from the wicked. They dare not bear such true testimony as might offend a person of high status. They are slothful and lazy in respect of religious obligations and are wholly preoccupied with worldly anxieties and concerns. They deliberately support falsehood and abandon truth….. Some of them see only evil dreams, of which a number come true, as if their brains have been fashioned only for evil and ill-omened dreams. They are not capable of having dreams that benefit them or indicate something good for another person. Their dreams are of a category which might be described as resembling the experience of a person who perceives smoke from a distance but sees neither the light of the fire nor feels its warmth. Such people have nothing to do with God and spiritual matters; they have been given only smoke which yields no light. Divine revelations to pious people who are non-Prophets are mentioned in the Holy Quran. Perhaps they fall in the second category of the recipients of true dreams as outlined by Promised Messiah. Numerous cases of non-Prophets receiving Divine-revelation are mentioned in the Quran. Revelations to the mother of Prophet Moses and Mother Mary are mentioned at more than one place. “The third category of people who experience true dreams and revelations can be compared to a man, who, on a dark and cold night, is not only guided by the bright light of a fire, but actually enters its warm circle, and is fully safeguarded against the effects of the cold. Only those people arrive at this stage who burn up the garment of low passions in the fire of love for the Divine and adopt a life of bitterness for the sake of God. They perceive death ahead of them and run forward to meet it. They accept every torment in the cause of God. For the sake of God, they become enemies of their ego and exhibit such a degree of strength of faith against it that even angels marvel at it. They are spiritual champions and all satanic assaults prove utterly ineffective against their spiritual strength. According to Promised Messiahas the revelations of this third pious group have four distinctions from the dreams or revelations of the other two groups. Firstly their revelations excel in clarity of the message and are not susceptible to multiple interpretations. Secondly their revelations excel not only in quality but also in quantity and are frequent and not just episodic or paroxysmal. Thirdly majority of their revelations cover subjects of great and possibly global importance and are not on trivial. Fourthly and most importantly their dreams and revelation speak of special favors from Allah and describe His love and closeness to the recipient. These revelations are accompanied by special Signs of Allah through which He plans to establish the reverence and admiration of these recipients among the God fearing. Di­vine revelations may not occur only in dreams but also while one is awake. Once Hazrat Umar ra was deliv­ering a Friday Sermon and suddenly shouted, “O Saria, towards the mountain.” This, out of context and least expected, did sur­prise the audience who dared to seek an explanation after the Sermon. Hazrat Umar ra told them that he visualized that Saria’s army, engaged far away at that time, was in mortal dan­ger and could only save itself by moving into the shelter of the mountain there. He also said, “Allah has many troops and one of them may convey his message to them.” Later, the messenger, who brought the news of victory in that battle, was asked whether they had heard Hazrat Umar ra directing Saria to move towards the mountain. He confirmed that they did hear and it sounded like Hazrat Umar. They were able to save themselves by acting accordingly. This episode combines vision with verbal revelation and what was essentially meant far Saria was also heard by his troops, loud and clear. The Sura Yusuf goes onto describe the life history of Prophet Josephas. He like his father and as had been promised became well versed in interpretation of dreams. He got a chance through Allah’s Providence to demonstrate his profound wisdom in this sphere and his repute reached the royal court. In time he was asked to interpret the following famous dream of the king of Egypt. According to the Quran, this dream was narrated to Josephas, while he was serving a prison sentence under a false charge. It was a strange dream, which had baffled the great sages of the king’s court, but did not present any difficulty to Josephas who rightly discerned its underlying message. It was this wise and masterly interpretation by him which was completely supported and testified by the events of subsequent years. In his dream the king had seen seven healthy, green ears of corn, and seven dried ones, carrying hardly any seed. He also saw seven lean cows devouring seven others who were strong and fat. When he related this dream to his courtiers demanding an interpretation, they dismissed it as mere subconscious ravings of his mind, carrying no significance. Now it so happened that a servant of the king who had served a term with Josephas in the same prison was present at this occasion. He too had seen a strange dream while in prison, which Josephas had correctly interpreted, indicating that he would soon gain his freedom and return to serve his master, the king, once again. Hoping that Josephas might possibly interpret the dream of the king as well, he suggested that he should be sent to meet him. Having obtained permission, he visited Josephas in prison and related the king’s dream to him. Josephas immediately grasped its significance and explained it so logically that there was no ambiguity left. In the seven years which would commence from the time of the dream, God would shower His blessings upon Egypt in the form of abundant rains, resulting in bountiful crops and fruits. After these seven years of bumper harvests, seven lean years would follow bringing drought in their wake. These years would result in disastrous famine unless crops from the previous seven years were saved and stored to compensate for the loss of the drought years. This interpretation impressed the king so profoundly that he issued orders for the immediate release of Josephas who, opted instead to remain in prison until a fair enquiry was held and the false charges against him were dropped. It was after he was honorably acquitted and the real culprit confessed her crime that he agreed to be released. He was exceptionally honored by the king and was appointed minister of finance and economic affairs in his government. To the surprise of all, the events foretold in the dream came to pass exactly as interpreted by Josephas. As such he not only saved the people of Egypt from disaster but also benefited the nomadic tribes and the populace of neighboring countries. The same events also resulted in reuniting Josephas with his family. In the words of Hazrat Mirza Tahir Ahmad Khalifah Tul Masih IV, “A dream like this with its subsequent fulfillment could in no way be dismissed as a glutton’s overfed fancy.” It cannot be attributed merely to the subconscious mind. The king’s subconscious mind had no access to this information whatsoever. This was a clear case of revelation. The Quranic description of this history should suffice for a Muslim to illustrate how the internal psychic mechanism is activated by God with a purpose. Promised Messiahas. Haqiqat-ul-Wahi, Ruhani Khaza’in, vol. 22, pp. 8. Promised Messiahas. Haqiqat-ul-Wahi, Ruhani Khaza’in, vol. 22, pp. 1-70. Promised Messiahas. Haqiqat-ul-Wahi, Ruhani Khaza’in, vol. 22, pp. 26. John K Williams. The Wisdom of Your Subconscious Mind. 1973. John K Williams. The Knack of Using Your Subconscious Mind. Prentice Hall Inc. New York, 1952. Walter Bradford Cannon MD, Emeritus Professor of Physiology at Harvard University Medical School. The Way of an Investigator. Hafner Publishing Company, London and New York, 1968. Dr. Ed­mund W. Sinnott. Cell and Psyche. Chapel Hill, NC. University of North Carolina Press. Dr. Leon J Saul. The bases of human behavior. Philadelphia. J B Lippincott. Hazrat Mirza Tahir Ahmad, Khalifah Tul Masih IV. Revelation, Rationality, Knowledge and Truth. Chapter: The Nature of Revelation. The Holy Quran. Al Jinn 72:27-28. Braheeni Ahmadiyyah Volume III, pp. 210- 218, footnote 11 (Amritsar, Safir Hind Press, 1882); Now published in Ruhani Khazain, Volume 1. London, 1984. Promised Messiahas. Haqiqat-ul-Wahi, Ruhani Khaza’in, vol. 22, pp. 22-25. Promised Messiahas. Haqiqat-ul-Wahi, Ruhani Khaza’in, vol. 22, pp. 69. Hazrat Mirza Tahir Ahmad, Khalifah Tul Masih IV. Revelation, Rationality, Knowledge and Truth. Chapter: The Nature of Revelation, page 252. Good dreams are also from Allah Ta’aala. Prophet Muhammad said, “If anyone of you has a dream that he likes then it is from Allah. He should thank Allah for it and narrate it to others.” (Sahih Al-Bukhari) Good deeds consist of people doing Halaal (lawful) acts. The physicians have prescribed some natural means for sleep but I have observed that when Allah wants to reveal something to me, He suddenly brings a state of drowsiness and sleepiness in the midst of perfect wakefulness. He takes me away from a physical to a spiritual realm and after He has revealed something, he bestows full consciousness that the recipient of revelation has a chance to assimilate the revelation. He gives drowsiness again and wakefulness again to memorize, at times these cycles can up to 50 times and these are special influences from God. Such revelations are not the same as normal sleep and the physicians do not understand the details of this. This very instructive description was mentioned in 1900 more than 5 decades before the discovery of REM sleep in 1953. Pingback: Book of the week: Age of Reason by Thomas Paine in the Islamic light – Is the West ready for Islam?